When you need more daily help than you can get at home, or when you’re done with the ongoing tasks of home chores and maintenance, assisted living facilities are a popular alternative to aging in place. These communities, sometimes also known as congregate care or residential care facilities, give residents the help they may need with daily tasks. They also provide hot meals and snacks, housekeeping services, group transportation to area stores and medical facilities, and other services. Assisted living is an option worth considering if you or your loved one needs help getting around the house, running errands, taking medication on time, cooking or cleaning the house. Even if you don’t need help with these activities now, you may prefer to let an assisted living staff handle meal preparation, housekeeping, and home maintenance chores so you can spend more time on friends, family, and your favorite pastimes. The national median cost of assisted living is $43,539 per year. More than 735,000 US seniors are assisted living community residents. The "typical" assisted living community member is an 87-year old woman who is mobile but has a couple of chronic health issues and needs help with 2 to 3 activities of daily living (such as bathing, dressing, and grooming). Eight out of ten assisted living residents needs help managing their medication schedule. Private living quarters, which can range in size from a studio to an apartment with 2 or more bedrooms for guests and roommates. All apartments will have private baths and kitchenettes or small full kitchens. Daily meals, usually served restaurant style at regular times in the community dining room. Private dining may also be available. Fun things to do, such as regular movie and game nights, guest speakers including people from community groups and candidates for local office, holiday parties, group outings to museums and special events, and worship services. Group transportation to area grocery stores, department stores, doctors’ offices, and other destinations. Some assisted living centers offer "a continuum of care." This means the assisted living community also provides other levels of care, such as short-term skilled nursing for rehabilitation, long-term nursing care, and specialized care and residences for dementia. The advantage of living in a continuum-of-care community is that you’ll face fewer moves if your care needs change, and those moves are generally from one wing or building to another, rather than to another facility in another part of town. You’re also more likely to stay in touch with fellow residents and enjoy familiar surroundings. Depending on the community you choose, you may have some options for pampering yourself without leaving home. Most assisted living facilities offer extras on-site that residents pay for on their own, separate from their monthly room and board. These may include massage therapy sessions, personal laundry service for your clothing, salon services including hair and nail care and beard grooming, and private transportation when you need it. As with so many things related to senior care, there’s the national median ($43,539 per year or $3,628 per month) and then there are big variations by state, and even from city to city within the same state. For example, Genworth’s Cost of Care Calculator lists the 2016 monthly median cost of assisted living in Massachusetts as $5,463—significantly higher than the national median. In Florida, it’s $3,045, but it varies by exact location. In Cape Coral, the monthly median is $3,360, while in Miami it’s $2,500—almost $1,000 less per month. You’ll want to do your homework to get a sense of prices in your area as well as what’s included at those rates. You may find that the best bargains are close to your current neighborhood, or you may find that the community with the rates and services you want is across town, in another city, or even in another, less expensive state. For qualified veterans, surviving spouses, and vets with spouses who need care, the Aid & Attendance pension pays as much as $1,794 per month to a veteran, $1,153 per month to a surviving spouse, or $2,127 per month to a couple. A veteran filing with a sick spouse is eligible for up to $1,410 per month. That money can be put toward assisted living fees and other forms of care. The Aid & Attendance Pension benefit is available to wartime veterans and their surviving spouses, as long as the veteran’s active-duty service period totaled at least 90 days, with one day starting or ending during war time. Veterans with sick spouses may also qualify for the Aid & Attendance pension. All applicants must have assets worth less than $80,000. The applicant’s home and vehicles are not included in the VA’s asset assessment. To apply, you’ll need to submit a Veterans Application for Pension or Compensation, a copy of your DD-214 or separation papers, copies of your medical-expense receipts, health records, financial statements, and written documentation from their physician showing the need for help with activities of daily living such as bathing, medication management, or running errands. Be sure to send copies and hold onto your original documents for later use. Here are more detailed instructions on how to apply for the benefit. Be prepared to be patient, too. 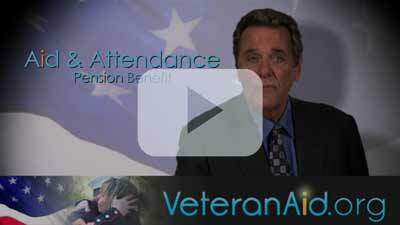 It can take several months for the VA to process your Aid & Attendance application. If you’re approved, you’ll start receiving monthly payments and you’ll get a one-time retroactive payment covering the time elapsed from the date of your original application. If you need help or have questions about the Aid and Attendance application, feel free to visit our forums to post your question and read others’ success stories.